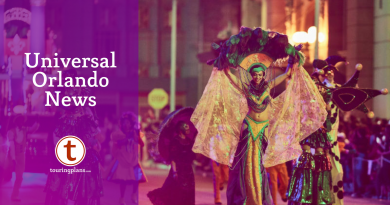 Universal Orlando’s family-friendly Mardi Gras celebration returns February 6 – April 4, 2019 at Universal Studios Florida. This year features a refreshed food and drink menu, brand new parade floats, and a killer line up of musical acts. 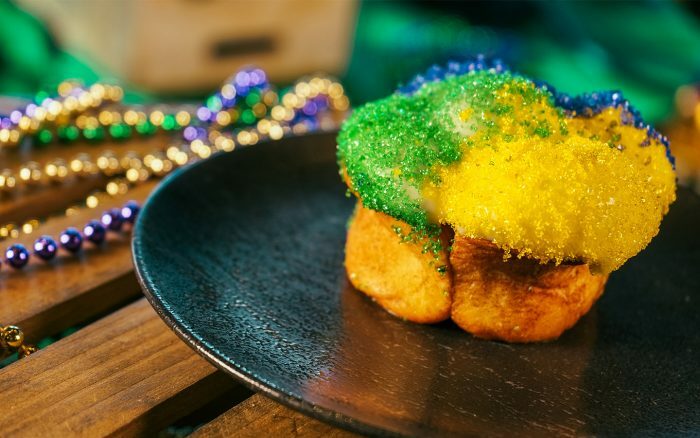 So grab a beignet, some beads, and a mimosa as we cover the Do’s and Don’ts of Universal Mardi Gras. Universal has completely revamped their food and beverage options with a focus on food-festival-sized bites and drinks. The French Quarter Courtyard, located in the New York section, is host to the Mardi Gras food and drink booths plus New Orleans musicians and acts. Each booth is home to unique samples based on classic New Orleans dishes. Returning classic entrees include the beignets, red beans and rice, gumbo, and jambalaya in new sample sizes. New dishes include crab étouffée, king cake, fried catfish po boy, and a dedicated mimosa bar. Yes, a mimosa bar. A new sampling lanyard will be offered for those looking to try several items. If libations are more your style then check out the new mixed drinks and craft beer bar. Bring an appetite, you’ll want to sample every dish. What is Mardi Gras without a parade? Just as in the Big Easy a daily parade of stilt walkers, dancers, beads, confetti, and floats (designed by Kern Studios, the same company that makes the authentic ones in New Orleans since 1947) brings the party to the streets. While the parade is authentic, Universal’s version trades in the debauchery from New Orleans for a family-friendly party atmosphere. Each year the parade features new floats and theme. 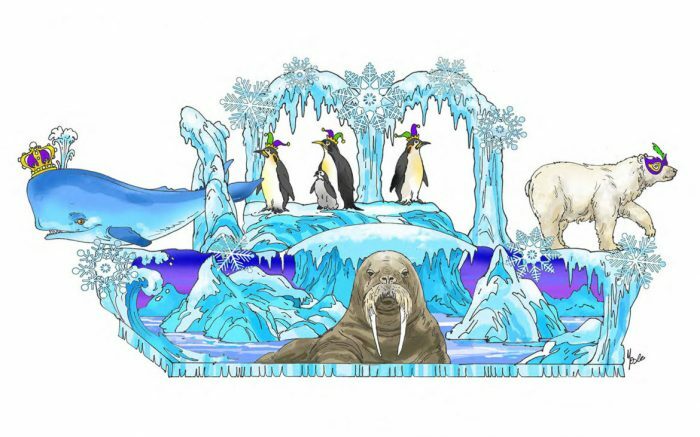 This year’s is no different with “Party Animal” floats from various biomes around the world. The parade starts at the large backstage gates next to Horror Make-Up Show and moves clockwise around the park. Those who want the maximum amount of beads line up in front of Horror Make-Up to catch the parade twice while the rest of the guests are located around the park. On concert days the parade route near Music Stage Plaza is more crowded with guests but is still the preferred location to watch if you wish to see the parade and musical guest. The parade runs daily at select times; check the daily schedule at the park or online for times. For guests who want to do something a little more exclusive a select amount of guests are invited to ride on the floats and throw beads. Look for Team Members in parade gear in the afternoon near Horror Make-Up Show to sign up. Guests are required to show up early and are held after the parade, do not participate if you wish to see the concert or only have one day at the park. During Mardi Gras the Music Plaza Stage comes alive on select nights with hit musical acts. This year Universal invited the biggest names in contemporary music to perform. Each concert starts at 8:30 p.m., but guests line up very early for a prime spot. For the most popular acts show up at least two hours prior to show time and an hour early for other acts for prime viewing locations. Guests who have a passing interest in the concerts should check the crowds an hour prior showtime to gauge crowds. It is advised to be at the Music Plaza Stage at least half an hour prior to show time to see any acts. Located in front of Race Through New York starring Jimmy Fallon, the French Quarter Courtyard is home base for Mardi Gras. Open daily at 4:00 p.m. the courtyard features food, music, drinks, and dancing. Decorations and theming give the impression you are experience an intimate street festival in New Orleans. Here is where musicians from New Orleans perform blues, jazz, and zydeco music. Live actors and dancers roam the streets interacting with guests. Authentic cuisine is offered for an additional price along with new drinks such as mimosas, craft beer, and mixed drinks. A visit to Universal can be frantic and overwhelming, take a load off with a king cake and enjoy the atmosphere in the courtyard. 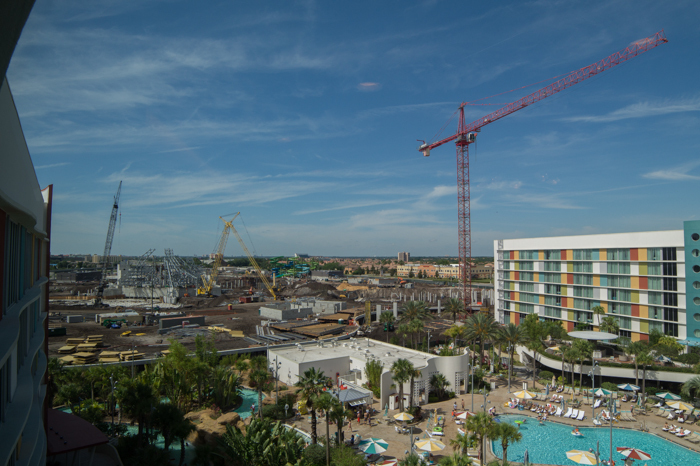 A full day at Universal is tiring for even for hardened theme park vets, but do not give up. Universal’s offerings during Mardi Gras are top notch and worth waiting for. The music, food, entertainment, and decorations are world-class offerings you do not want to miss. Make sure to take a mid-day break while touring so you will be ready to dance the night away. The fun does not have to stop when the parks close. Continue the festivities at CityWalk in one of several clubs or see the amazing Blue Man Group next to the park. Make sure to check out the bead tree, the unofficial mascot to Mardi Gras, located on the right while exiting CityWalk towards the parking garages. 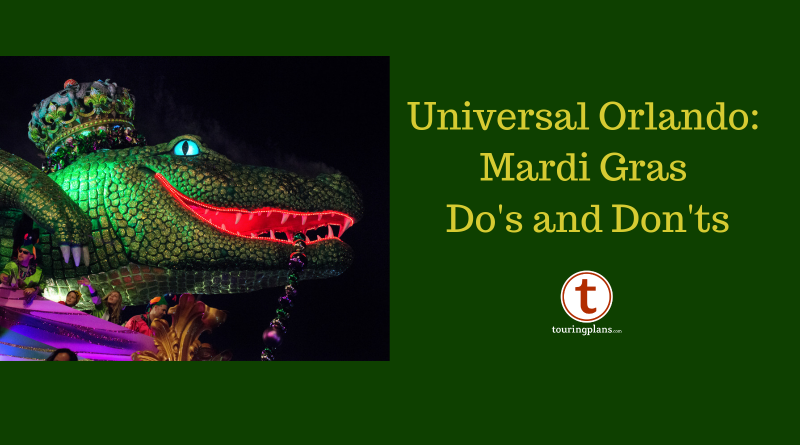 What are your top Do’s and Don’ts for seeing Universal’s Mardi Gras? We will see you again soon for the Do’s and Don’ts of visiting The Wizarding World of Harry Potter. Is the parade daily during Mardi Gras? Or only on concert days?